The Fourth Bureau Issue Committee of the United States Stamp Society studies the U.S. definitive stamp issues starting with the issue of 1922-25 (Scott 551-571) and goes through the Garfield coil of 1932 (Scott 723). With this new series of stamps, the country re-focused its stamp themes from those of Washington and Franklin to a wide range of Americana including colonial forefathers, past presidents and icons of America known and recognized worldwide. 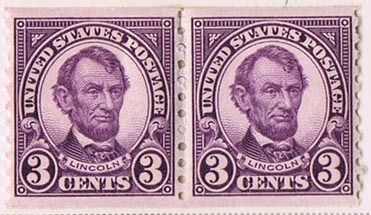 The issue spans a period of 16 years until the introduction of the Presidential Series in 1938 and saw widespread use into the World War II era. This is an important era because it saw stamp production change from the age old flatbed presses to rotary press production when gum breakers, perforation changes, Bureau precancels and overprints such as the Kansas-Nebraska issues all made philatelic headlines. Postal history is also within the scope of the committee and we have a great wealth of developments in such things as rate changes for graduated registry fees and the birth of domestic and international airmail to study. As the centennial anniversary of the Fourth Bureau Issues approaches, USSS members are invited to delve deeper into the many great stamp production and postal history varieties that abound and ask questions of the committee, write-up their finding for the journal as an article or otherwise communicate with us about our fascinating area of interest.